How We Discovered This Book: My daughter received this as her monthly Imagination Library book in July. For more information on the Imagination Library, you can read my previous post. A boy is trying to read a book, but a tiger keeps interrupting him with chomping gum, playing trains, and pretending to be a bear. Neither one will be happy until they find a solution that works for both of them. This a simple story (we never find out the boy’s name, but it doesn’t matter). 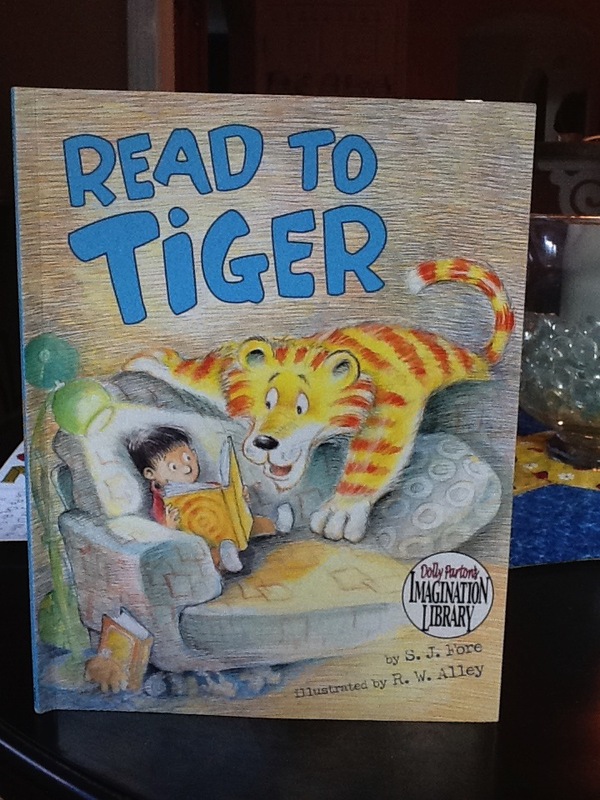 The boy tries to get Tiger to stop over and over until they decide to read the tiger book (!) together. I wonder what would have happened if the book the boy was reading was about something else? My son has transitioned to chapter books that he reads himself (he loves, loves, loves Geronimo Stilton) and my daughter can’t get enough of picture books, so I thought I’d start listing what they both thought. My son saw the parallel between this book and how he reads to his stuffed puppy sometimes (who he pretends is alive sometimes, too). My daughter liked the illustrations, and the look on the tiger’s face (with is very innocent and inquisitive, not threatening at all). This story also reminds me of when my daughter is bugging my son while he is reading alone, so he decides to read to her instead. Activity: The tiger uses lots of sounds when he plays- choo choo, chomp chomp, grrrr. Brainstorm other sounds. Then try to guess what tiger (or a child) might be doing if they were making that sound. I have been working on my first middle grade novel for a while now, and after some serious revisions and another read by two valued 12-year old readers, I felt like it was in a really good place. My goal is to have the manuscript out to agents before the end of the year. My last task was to have my writing partner Joanna read it. Joanna has been with Amelia’s story since it was just a germ of an idea, and she always gives me insightful and valuable advice. I was sure she would bless the manuscript, and I would send it on its way (okay, in retrospect, that was a little optimistic of me). What I got instead was lots of feedback. On the nose, “you’re absolutely right” feedback. Feedback I didn’t want to hear. Sigh. I thought I was done! Yes, I understand the fluid nature of writing. And I know that the manuscript will never be perfect. Perhaps I was really mad at myself for not seeing the important things that Joanna saw. But then, that’s what a good writing partner is for, right? Amongst the failing leaves and shrivelled up stems, I found green beans. TONS of green beans. Once my pole beans get started, they really produce. 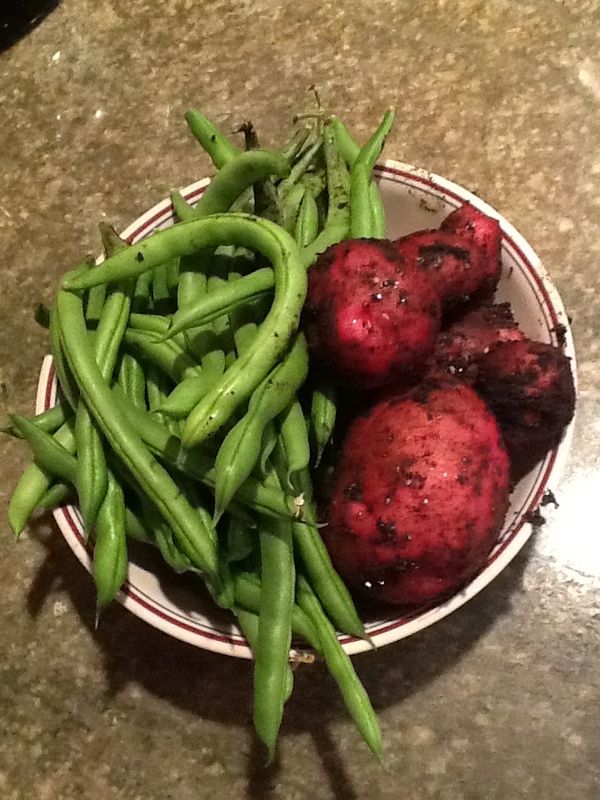 I can typically go out and harvest plenty for dinner twice a week for about 4 to 6 weeks. I also saw some new potatoes peeking up. I thought they were done! Reaching into the moist dirt, I found potato after potato. Plenty for Sunday dinner tomorrow night (With butter! I can taste them already). As I brought in the overflowing bowl of vegetables, I was struck at the feeling of unexpected bounty. Perhaps I should feel the same way about my novel? When I thought it was finished, there was more to come. In the case of the garden, it was wonderful and yummy. So why not the novel too? So next week I will dig back into revisions, with green beans and potatoes on my mind. Hopeful of the great possibilities yet to come with Amelia’s story. Are you mourning the end of summer? Or something else you don’t want to end? Perhaps there is more to come. Not what you had planned, but possibly even better.